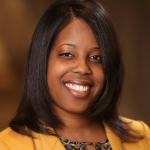 The American Speech-Language Hearing Association (ASHA) recently honored JSU’s Dr. Brandi Newkirk-Turner, chair and associate professor of Communicative Disorders in the School of Public Health, for her contributions in research, clinical services to multicultural populations and teaching. Her work, which includes research related to child speakers of African-American English, earned the Certificate of Recognition for Special Contributions in Multicultural Affairs. 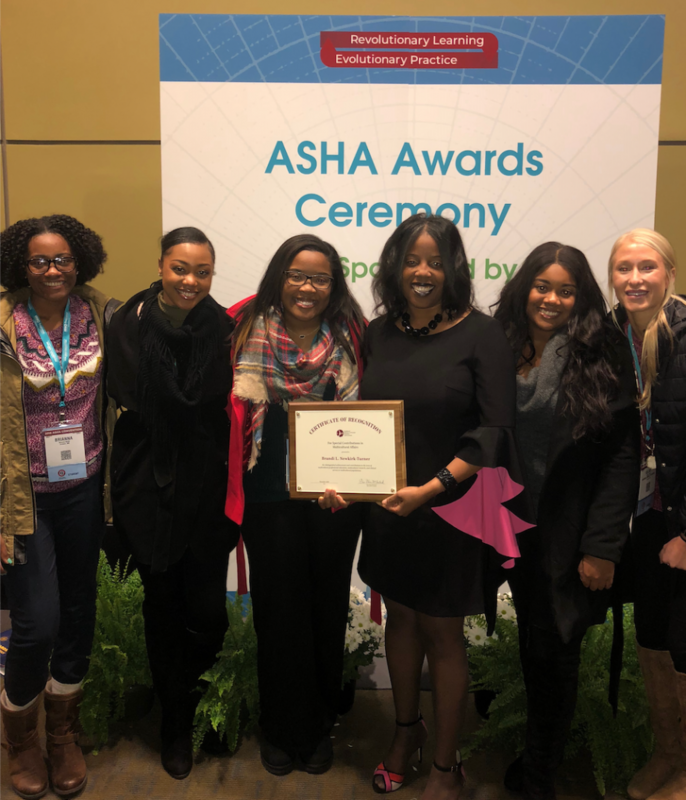 With several of her students present, Newkirk-Turner accepted the honor Nov. 16 during the annual convention of the American Speech-Language Hearing Association in Boston, Massachusetts. JSU’s Communicative Disorders chair Dr. Brandi Newkirk-Turner is congratulated and joined by her graduate students at the annual convention of the American Speech-Language Hearing Association in Boston, Massachusetts. The School of Public Health students are part of her grant, which funded their trip for professional development. The commendation is vital because Newkirk-Turner’s professional colleagues make up less than 4 percent who identify themselves as African-Americans. “For that reason, JSU has a unique opportunity to prepare African-American students venturing into the field of speech-language pathology. A lot of my work involves providing greater access to the field,” Newkirk-Turner said. Despite many responsibilities, she’s visited a pre-school weekly for about five years to help children who require language and literacy services. Also, by writing grants, she has earned funding to support the graduate education of more than 20 students, providing them with scholarships, stipends and other financial support. “In general, the ASHA award captures contributions I made in research, teaching and service to multicultural population,” Newkirk-Turner said. According to its website, ASHA is the national professional, scientific and credentialing association for 198,000 members and affiliates who are audiologists; speech-language pathologists; and speech, language and hearing scientists. It also includes audiology and speech-language pathology support personnel and students. Over the years, Newkirk-Turner has aggressively sought and received funding for various projects. Recently, she and co-principal investigator Dr. Ronica Arnold Branson in the College of Education and Human Development received a $1 million grant from the U.S. Department of Education’s Office of Special Education Programs. Those funds will help prepare students from Communicative Disorders and school counselors to assist children with disabilities and high-intensity needs. With the newest funding, she’s now managing three grants with a multicultural focus, including one from the National Science Foundation. Overall, in eight years, she’s brought in more than $2 million in grant funding.